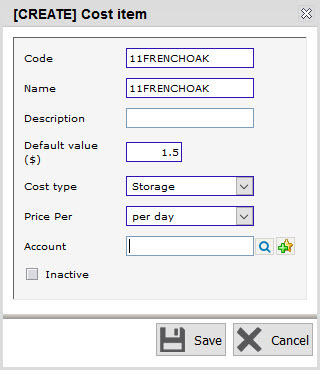 Barrel storage costs (barrel depreciation) can be added to bulk wines in barrel by linking your barrels to Cost Items and running the utility under Tools – Costing – Storage costs. First, you will need to have the appropriate Cost items configured under Winery Setup – Costing – Cost items. You should have one of these configured for each different type of barrel or one for at least each different rate of depreciation; i.e., if you depreciate your 2011 French Oak at $1.50 per day and your 2012 American at $1.20 per day, then you would configure two separate cost items. Note: barrel storage costs can only be depreciated/applied at a per day rate within vintrace. Each barrel will then need to be linked to the Cost item under Winery Setup – Vessels – Barrels, then go to the Advanced tab. 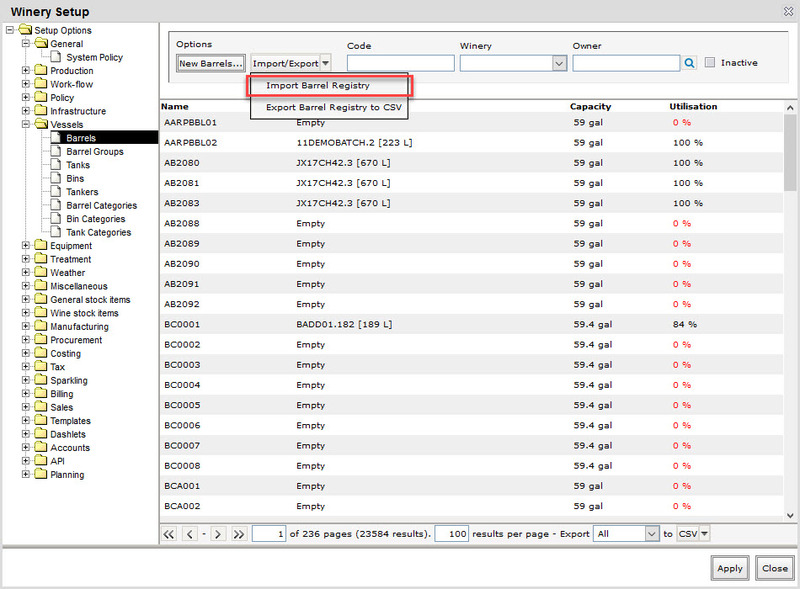 To make this easier for a large number of barrels we recommend using the Import/Export utility to update barrel details in bulk. 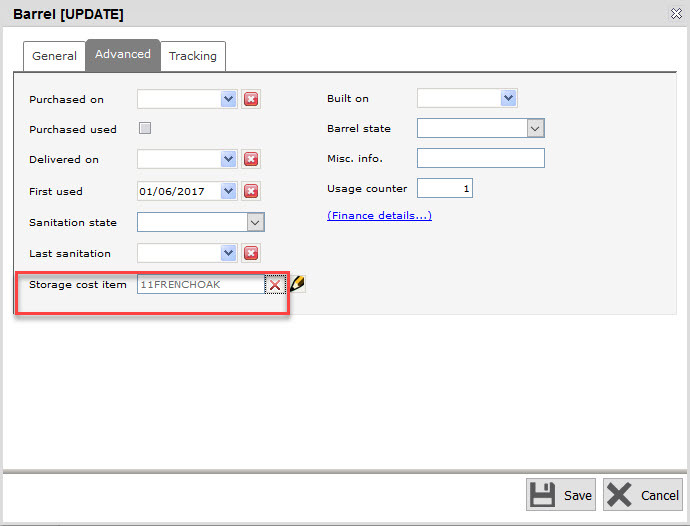 You can set the storage cost item against multiple barrels by using the barrel importer utility in Winery Setup – Vessels – Barrels – Import barrel registry. Please refer to this article for more information on importing data. 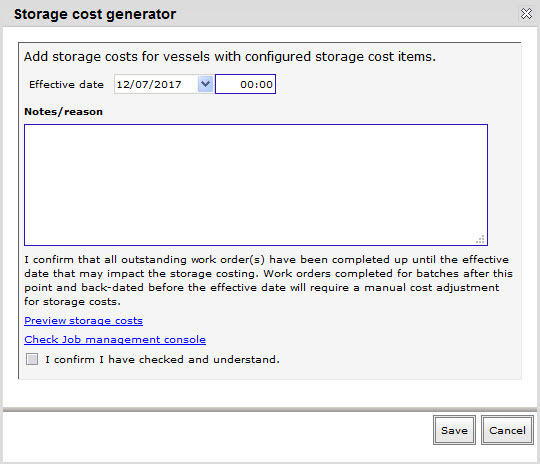 Set the Storage Cost Item and Depreciation Start Date in the import file for the barrels you want to set the storage costs against. Important: You need to set the Depreciation Start Date as the date you want to start the storage costs so you don’t add extra costs to wines with storage costs already factored in. Contact support if you require assistance with this step. 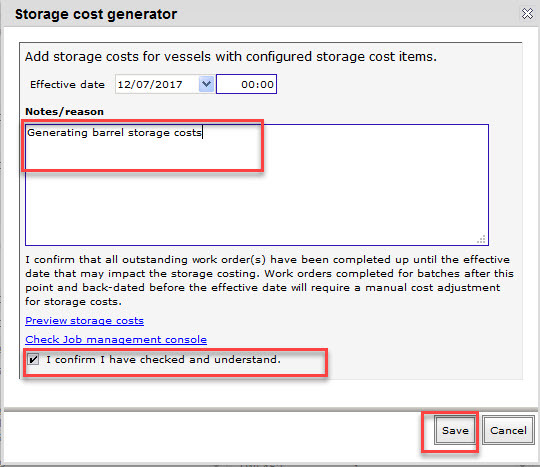 Once you have configured the barrels to have storage costs, you can use the utility under Tools – Costing – Storage costs. First, set the Effective date to the last date you want storage costs loaded. We suggest running this monthly and backdating this to the end of the previous month. There is a confirmation message here that you must agree that you have checked and ensured all outstanding work orders for barrel work has been closed off in the system up until the effective date. Please use the Check Job management console link to check the scheduled task work-list across all facilities. You also have the option to Preview storage costs; we encourage you to use this link before saving the costs to ensure you see what you would expect. When you are satisfied with the costs, add a reason or note in the text box provided, tick on the I confirm I have checked and understand checkbox, and then click on Save. This will add the costs to all the wines up to and including effective date. vintrace has built-in smarts to know that if a wine was only in barrel for 10 days of the month, only 10 days worth of cost should be added to that wine, even if that wine has now been racked to tank or bottled. Unlike other systems you should not need to run this utility daily, although you may take a while becoming comfortable with the process.